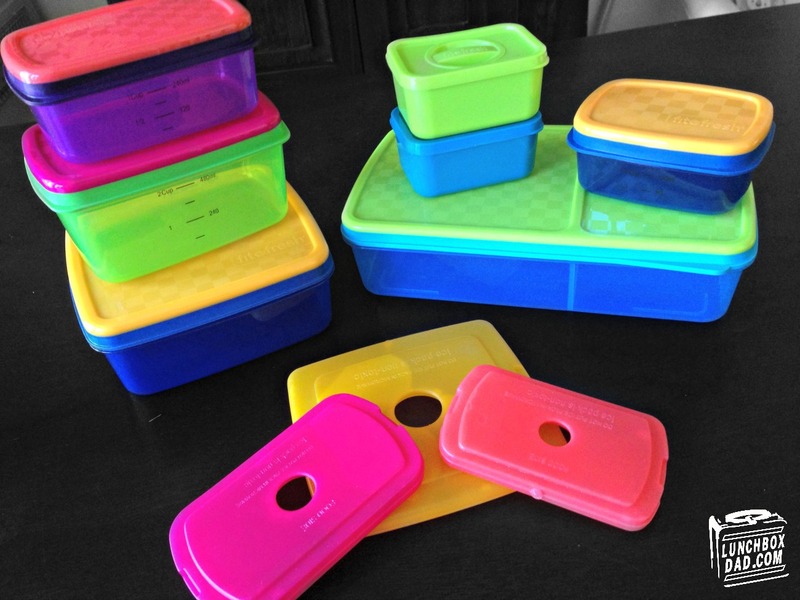 Lunchbox Dad: Review: Fit & Fresh Lunchboxes: Are They Fun & Functional too? 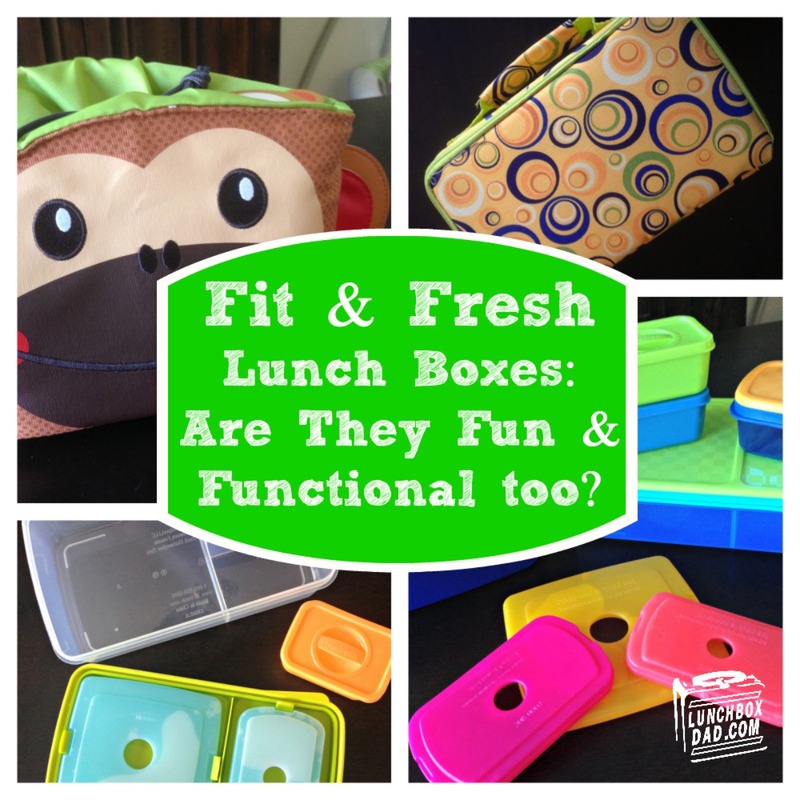 Review: Fit & Fresh Lunchboxes: Are They Fun & Functional too? It's almost "back to school" time which means shopping for pencils, paper, and lunchboxes. Investing in the right lunchbox is an important decision. As the parent you need the container to be practical and help your job to be easy. Your child wants the box to be cool so they can show it off to all their friends. I had the opportunity to put the Fit & Fresh line of lunchboxes to the test over the past few weeks. They carry every possible size and color of lunch container you can imagine. Whether you are a kid, or adult, Fit and Fresh has an option for you. The thing is, none of that matters if the quality is poor or the kids don't like the look of them. So read on to find out what I found when I tested the Fit & Fresh line for fun AND functionality. Make sure and check back Monday for a special lunch I made in these lunchboxes! As you can see from the pictures above, the containers come in many fun colors and in any size you could ask for, including a full bento box. One of my favorite features is something that you don't think about until you already have the lunch ready--the ice pack. It can be a trick figuring out where to put them. 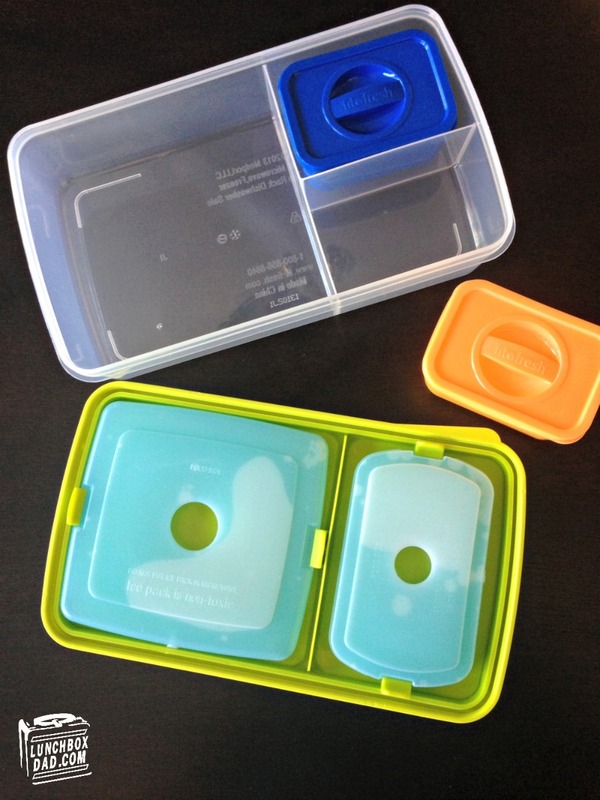 Fit & Fresh created a little latch system inside each lid that will hold their ice packs. I love this idea! When I used them to take my own lunch to work, it kept the turkey pasta nice and cold. All of their containers are BPA free and top rack dishwasher and microwave safe. This is important because you don't want to spend a bunch of time cleaning parts by hand if you don't have to. I ran each box through the dishwasher multiple times and they came out good as new. I also tested them in the microwave without any problems. One of the issues I am always concerned about with these types of boxes is if my kids can open them. My daughter is going into second grade and has had some issues with this before. The Fit & Fresh lids are plastic with a soft lip around the edge. My daughter could open it no problem but I would test it out with younger kids before I sent them to school with it. The one change I would make is with the bento box (pictured on the left). I wish the plastic dividers were removable so that you could reconfigure the box to work with other smaller size Fit & Fresh containers. Currently, you can only fit their smallest size containers. The bento style lunchbox can also be used with their insulated bag. These bags come in a variety of fun designs. I would highly recommend you get their bag if you are picking up a bento box. They work well together. The Fit & Fresh containers are sold individually and in kits. It is up to you to choose the amount of containers and style that is best for your child. 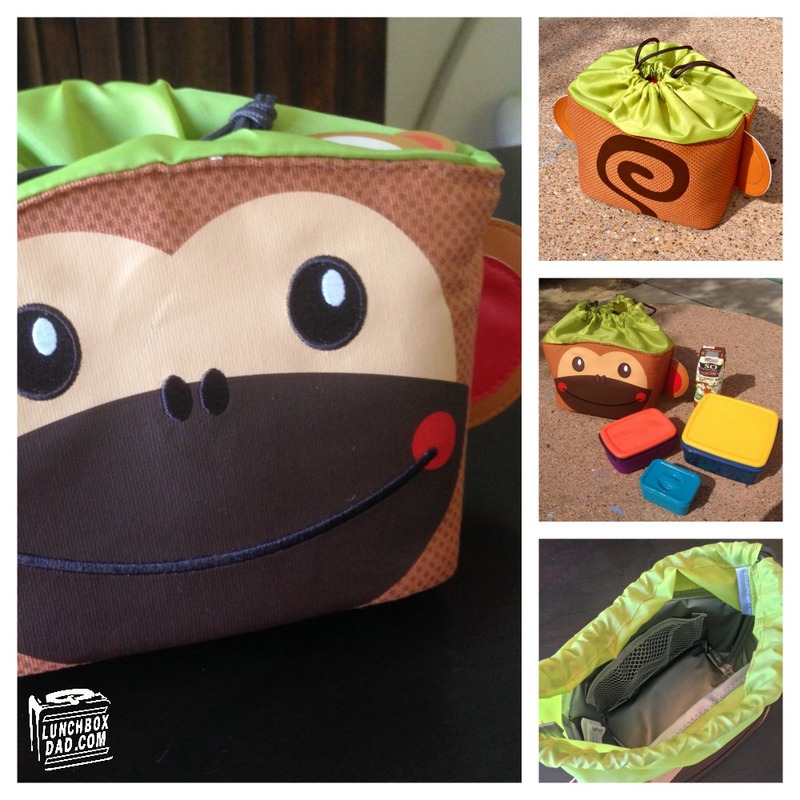 The other product I was fortunate enough to review was a drawstring insulated lunch bag...and it was shaped like a monkey! This might be the coolest lunch bag I have ever used. I even packed my lunch in there and took it to work one day. There is a monkey face on the front with a tail on the back. The top is opens and shuts with a drawstring. Inside is room enough for three lunch containers and a juice box or small water bottle. Also inside is a little pocket which can hold silverware, napkins, etc. In my lunch, I was able to fit a sandwich sized container with pasta in it, a medium container with grapes, and a small container with a little dessert. I did wish this bag was big enough to fit a bento style box, however. The only part that i felt was missing from the monkey bag was a carrying strap. The drawstrings must double as a carrying strap. This is a little annoying at times. The whole bag can be easily wiped down to clean it. This monkey bag sells for $14.99. There are other animal varieties of this style for sale as well. Overall, I was very pleased with Fit & Fresh's line of products. They offer a wide variety to fit many people's tastes and the products seem to be well made. They work easily for adults and kids and are also reasonably priced. You can go to www.fit-fresh.com to see all of their products and to place an order. Please be sure and check back Monday to see the fun lunch I made in the Fit & Fresh bento lunchbox!